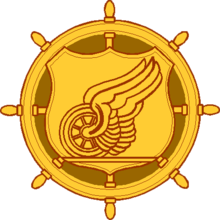 The Transportation Corps was established 31 July 1942 by Executive Order 9082. The Transportation Corps is a combat service support branch of the U.S. Army, and was headquartered at Fort Eustis, Virginia, but moved to Fort Lee, Virginia in 2010. It is also one of three U.S. Army logistics branches, the others being the Quartermaster Corps and the Ordnance Corps. The Transportation Corps is responsible for the movement of personnel and material by truck, rail, air, and sea. Its motto is "Spearhead of Logistics," and it is currently the third smallest branch of the Army. During the American Civil War, transportation proved to be an integral part of military logistics through the organization of railroads as a viable and efficient means of military transportation. The US Army centralized the management of rail into the United States Military Railroad (USMRR). The Army Quartermaster purchased eight City-class ironclads on the Mississippi River in February 1862, a full month before the USS Monitor and CSS Virginia set sail. City Point, Virginia in 1864 would become the largest port operation in the Western Hemisphere in 1864. By 1864, five of the nine divisions in the Quartermaster Department dealt exclusively with transportation. A substantial number of battles were won because of the field commander's ability to swiftly and effectively move troops and supplies. Most wounded soldiers were carried away in a banana-shaped cart called a gondola. During the Spanish–American War, the task of mobilizing and deploying a largely volunteer force to Cuba and the Philippines magnified the need for a separate transportation service within the Quartermaster Department. Army transporters worked with both the civilian railroads and the maritime industry to pull together a successful intermodal operation. The American Expeditionary Force that deployed to France during World War I emphasized the need for a single transportation manager. William W. Atterbury, a former railroad executive, was commissioned as a brigadier general and appointed as the Director-General of Transportation and a separate Motor Transport Corps of the National Army was established to manage trucks on 15 August 1918. The United States Army School for Truck Drivers had been established by 9 July 1918; and the Transportation Corps of the AEF was abolished after the war, The M.T.C. subsequently conducted Transcontinental Motor Convoys in 1919 and 1920. On 9 March 1942 the Transportation Service was established as part of the Services of Supply, and on 31 July 1942 the Transportation Service became the Transportation Corps. In March 1942, the transportation functions were consolidated into the Transportation Division of the newly created Services of Supply. By the end of the war the Transportation Corps had moved more than 30 million soldiers within the continental United States; and 7 million soldiers plus 126 million tons of supplies overseas. One of the greatest feats of the Transportation Corps, via the Military Railway Service, was the rebuilding of France's shattered railroad network after D-Day and the transportation of 1,500 locomotives and 20,000 railway cars specially built for the lighter French track system starting With D-Day +38. To speed the process, and avoid delays caused by French channel ports and docks destroyed by the retreating Germans, the Transportation Corps brought the heavy railroad stock across the channel and across the beaches in specially built LSTs. As allied forces rapidly advanced across France in the summer of 1944 a special transportation operation nicked named the Red Ball Express was carried out. The Red Ball Express provided around the clock truck convoys from allied held ports to supply troops on the front. The story of the Red Ball Express was told in the 1950s movie Red Ball Express. There was as short lived television series in the early 1970s named Roll Out which focused on the experiences of a fictional African American motor transportation unit involved with the Red Ball Express. The Cold War between the United States and the Soviet Union extended from 1945 into 1991, spanning the Gulf War. When the Soviet Union cordoned off the city of Berlin in 1948, the Transportation Corps played a vital role in sustaining the city. Two years later, on 28 June 1950, President Harry S. Truman established the Transportation Corps as a permanent branch of the Army. During the Korean War, the Transportation Corps kept the UN Forces supplied through three winters. By the time the armistice was signed, the Transportation Corps had moved more than 3 million soldiers and 7 million tons of cargo. The Vietnam War saw the most diversified assortment of transportation units ever assembled. For over a decade the Transportation Corps provided continuous support for American and allied forces through an unimproved tropical environment using watercraft, amphibians, motor trucks and Transportation Corps aircraft. The enemy threat to convoys required a unique solution - gun trucks. On 31 July 1986, the Transportation Corps was inducted into the U.S. Army Regimental System. In 1990 the Transportation Corps faced one of its greatest challenges with the onset of the Gulf War. During Operation Desert Shield and Operation Desert Storm, the Transportation Corps working out of ports on three continents demonstrating its ability to deploy and sustain massive forces. According to a September 2010 article in the Army News Service, "The first students to attend classes at the new Fort Lee Transportation School will be those enrolled in the transportation management coordinator course - MOS 88N (Military Occupational Specialty). It is the only one of the seven transportation MOS-producing courses that will be taught at Fort Lee (the others are taught elsewhere)." For example, Cargo Specialist (MOS 88H), Watercraft Operator (MOS 88K) and Watercraft Engineer (MOS 88L) training is conducted at Fort Eustis, Virginia, as Fort Eustis is the main housing of the Army's Watercraft. Motor Transportation Operator (truck driver, MOS 88M) training is conducted at Fort Leonard Wood, Missouri. Railway training for Army Reserve soldiers (MOSs 88P, 88T, and 88U) and Army civilian employees has remained at Fort Eustis, as there are only warehouse tracks and no railway system available for training at Fort Lee. Wikimedia Commons has media related to United States Army Transportation Corps. ^ "Army and Navy Notes" (PDF). New York Times. 6 July 1919. Retrieved 3 April 2011. The newest of army training schools has just opened at the University of Virginia. It is the United States Army School for Truck Drivers. Over 500 men are now taking the course and the schedule of instruction calls for the graduation into the service of three classes of 600 men each between now and 20 Nov. next. ^ "There Highballing Now". Popular Science: 77–83. February 1945. This page was last edited on 12 February 2019, at 12:50 (UTC).